FuzzyWasabi: Fools On The Hill 7: Sons of the Golden Dawn - 19 neo-garage psych greats from the mid-80's/early 90's NEW FILE! 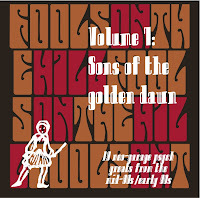 Fools On The Hill 7: Sons of the Golden Dawn - 19 neo-garage psych greats from the mid-80's/early 90's NEW FILE! New file uploaded now! We could have called it "New Psych Explorers from the 80's" or something similar… Psych being the important word here. We have another volume devoted to the harder/merseybeat/garage revival bands. Talking about revival, this is maybe what seperates the bands on this volume from the revivalists of the same period: Originality. I got sick of listening to punk rehash of every Nuggets/Pebbles songs out there. While fun while they were doing it (specially live), most of the revivalists sounds a bit "passé" now. The psych bands on this volume have certainly covered some classic psych stuff, but most of their LPs boast a lot of original songs. Their sound, although based in the classic 60's, also attempts to move forward and still prevents them from becoming aural postcards of a by-gone era. The other interesting point is that bands from all over the world got into the act. You'll find US, English, French and Spanish bands. Included is also my fave: the Vietnam Veterans. Hope this comp will give you new incentive to score some of their albums the next time you visit your neighbourhood Vinyl Dealer. We're building tomorrow with the comps of today. OOps, it appears that the previous zip file was corrupted. You will have to dowmload it again. I've just reupped a new file that is fine. Sorry! 2●Los Negativos ●¿Quien Aplasto A La Mariposa? Merci du commentaire! On est pas si loin de Nice que tout ça… L'album des Gitanes est très bon. I love these comps! Thank you so much! no can unzip... twice try. no good. Darn! Thanks for these comps, nice variety. the file can't open sorry. I saw them live last year here in Greece and they were full of energy! The album is very good too. Thanks for this compilations and the educational posts. Just in case you'd like to know, the Los Negativos song in this volume is titled ¿Quien Aplasto A La Mariposa? that translates as "Who Smashed The Butterfly?". BTW whatever happened to volume 3 of this series? Great comp, I'm going to have to track down more by these bands, thanks. My one reservation is that the single version of 'She don't know why I'm here' is so much better IMHO. YOU ARE THE BEST. Thank you for these. I wish there was a way I could get them all -- there are only a few on soul seek! This particular one has expanded my ears, vision, expectations, reactions, and I play tunes from it regularly on my radio show.